As all of us aware of the term “Web Browser”. Web Browser is the most widely used software. Web Browser is an application program which we used to access the INTERNET. Firefox, Google Chrome, IE , Opera, Safari. In this post I will tell you some internal of web browsers, like What is the main component of browsers and How they works? As we know that browser shows web page. Web pages are either HTML source file or HTML rendered page on browser. 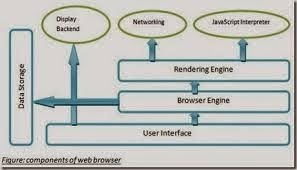 Browsers have many components but here I will tell you some important components of browser. HTML parser parse the HTML document and create the DOM(Document Object Model) tree. Rendering Engine: The main responsibility of this engine to display the content which is requested by the user. By default this engine can display HTML, XML and images. This can also shows the other type of document like PDF using Browser plugin. Rendering engine uses HTML parser to create DOM tree from raw HTML. Firstly it parse the HTML to create DOM and also parse the external CSS and inline CSS of the document. The combination of styling information with the visual information is used to create the render tree. Types of Rendering Engine: There are more than one type of rendering engine. Different browser uses different rendering engine. This is the reason same web page look different in different browser.